It would seem that the ombre paint effect is a look that’s not going anywhere soon (and we're totally okay with that). What started on the catwalk, and then spread to our hair, has now seeped into our homes both in fabric form and as a trendy ombre paint effect. 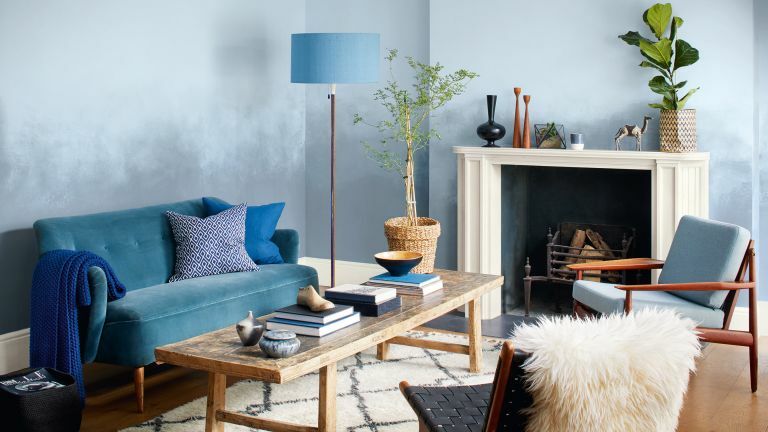 So, whether you're painting your house from top to bottom or are looking for inspiration to transform one room in particular, take note of our step-by-step instructions on how to paint an ombre accent wall. Want to achieve the ombre effect without painting? Take a look at our 10 stylish ombre effects for everything from paint to wallpaper and mural inspiration, all in the ombre style. What is an ombre wall? First, for anyone's who's missed it, the ombre paint effect is where one tone gradually fades into another tone of the same colour. The effect creates a big impact but it’s actually easy to paint your own ombre wall – and you don’t need much more than a few cans of paint, some paint brushes and a roller. Browse our pick of the best paint brushes and rollers for all your DIY projects to ensure you're equipped to tackle an ombre pain effect. Before you start painting, use a tape measure and either a pencil or some chalk to mark the points where you want your colour to start changing. Think about what would work best in your room. If your space is small, start fading your first colour about three quarters up your wall, this will create the illusion of a higher ceiling. Start with the top section. Using a roller or a wide paint brush, paint downwards with your lightest colour across the whole width of your wall until, at last, you hit your marked meeting point. Before the paint dries, take your second colour and paint the top of the lower section, keeping the edge where they meet uneven. Top tip: For the results, choose two colours that are similar in tone as these will be easiest to blend, or slowly add a colour to a large pot of white paint to darken it gradually (the downside to this is that you can't predict how dark your darkest shade will be). Find out more about choosing the right paint colours for each room. Using upwards and criss-cross strokes, start to blend the the borders between the two colours before they completely dry. The more you work, the more graduated the ombre effect will become, so keep going over the border until you achieve the look you want. Carefully apply more of either of your colours if you need to improve the blended look. Top tip: Practise the effect on a small section of wall before you do a whole room. If you pick an area behind a sofa, for example, you can paint over it and it won't be noticeable.